So I said the new year would bring along with it a new consciousness of what I'm eating, but there's one big problem with that, It's my birthday! I'm not one of those people who shy away from their birthday or have a fear of aging, quite the opposite, I see my birthday as a reason to go all out and bask in the attention that comes along with it. Each year I try to squeeze as many people into my tiny apartment as possible, make a crap load of snacks, and drink to the point where I won't recall the embarrassment I brought upon myself and my wife the night before. No, this is no time for holding back—I will eat whatever I want, and however much I want to on my birthday. 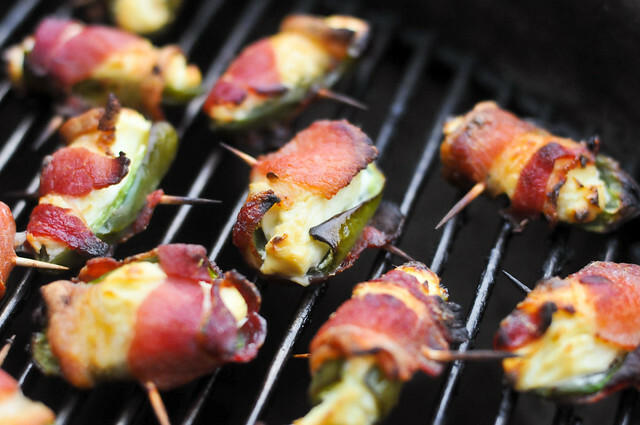 Up there on the scale of things horrible for you, that I'm sure to be devouring this weekend, are these bacon-wrapped jalapenos. Never has three simple ingredients ever come together to form such an amazingly awesome snack. 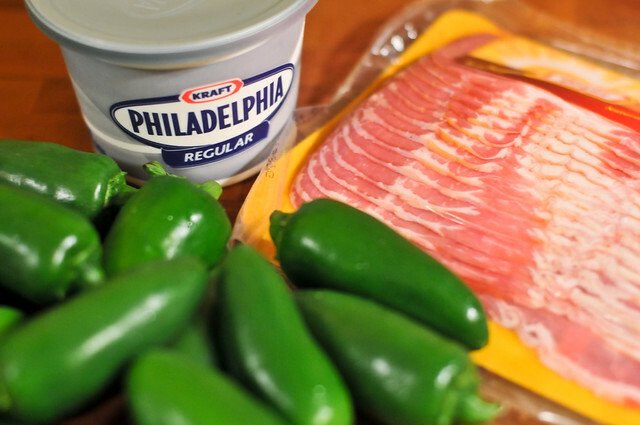 Spicy, fruity heat provided by jalapenos, creamy rich goodness from cream cheese, and a salty, meaty crunch from bacon combine together to form serious deliciousness. The icing on top of the cake is just how easy they are to make. 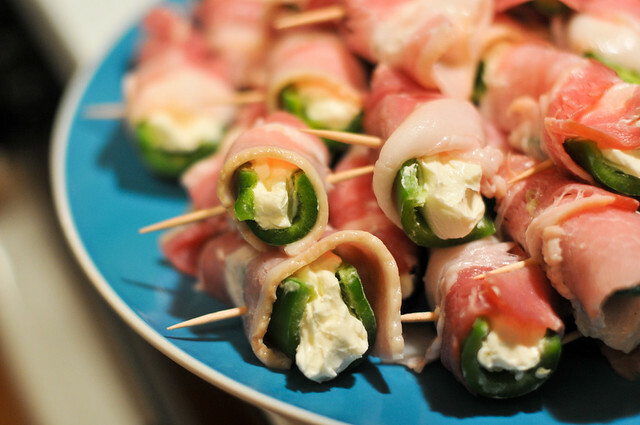 Jalapenos are split and seeded, given a spoonful each of cream cheese, then wrapped in 1/3 of a strip of bacon. A toothpick skewered through the side holds the whole thing together while it also provides a nifty handle to eat them with later on. I once defended the use of a chili grill—a device that holds peppers upright while cooking—but I've since grown a dislike for it. I don't regret buying it (mainly because it's in the shape of Texas, and that's awesome) but it does have many drawbacks. First, seeding a whole pepper is much more work than after it's been split in half, and minimal effort is one reason these are so great. Second, the bacon can only cover the top of pepper, making not every bite bacon filled like it should be. Finally, the damn things gets messy and it's hard to clean, unlike when making them directly on the grill, which has no extra mess at all. 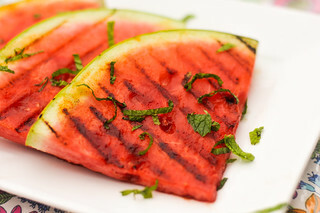 The best way to grill these babies is over indirect, high heat. 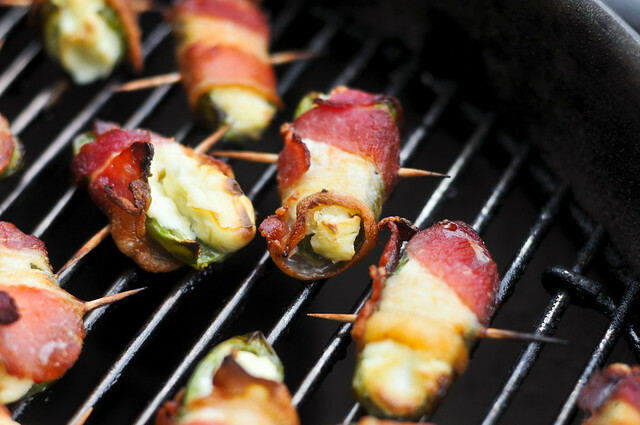 Just lay the jalapenos directly on the grill grate, cover, and let them go until the bacon gets browned and crisp. 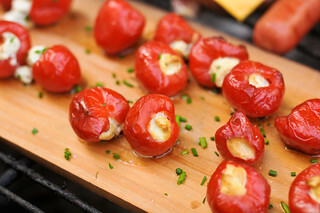 Not that these need any more flavor, but a chunk of a light smoking wood isn't a bad idea here, peppers do go well with a little smokiness. It takes about 20 to 30 minutes for them to be perfectly done. Now all that's left is to down every last one. While it may be impossible to resist eating them all at once while they're hot, these also stay good sitting out, at room temperature, making them perfect for a party, like at my birthday! I'm sure to be eating these all night long (I make a lot), and while they may not help me survive another year, they will certainly make me happy at the start of a new one. 1. 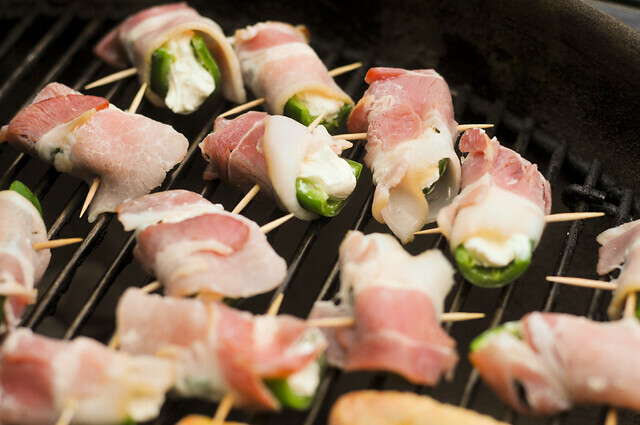 Place a spoonful of cream cheese in each jalapeno half, wrap in 1/3 strip of bacon, and skewer through middle with toothpick. 2. Light a chimney 3/4 full of charcoal. When charcoal is fully lit and covered in gray ash, pour coals out and arrange them on one side of the charcoal grate, keeping the other side empty. 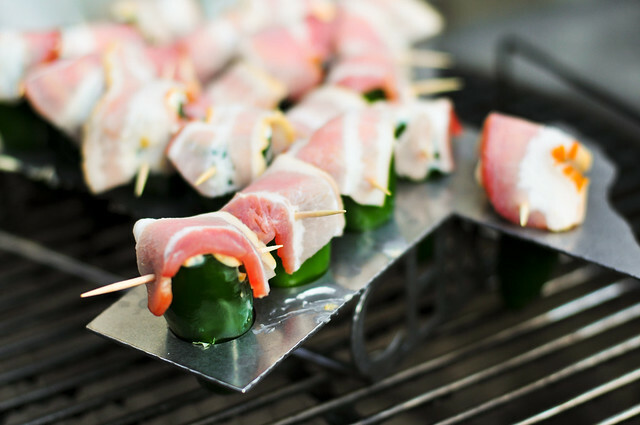 Place the jalapenos over the cool side of the grill, cover, and cook until the bacon is cooked and crisp, 20 to 30 minutes. Serve hot or at room temperature. LOVE ABT's they rock. The creamy smoky bacony peppery goodness one hell of a way to celebrate a birthday. @Chris Thanks. I stuffed myself silly with these at my party last night. Soooooo good. 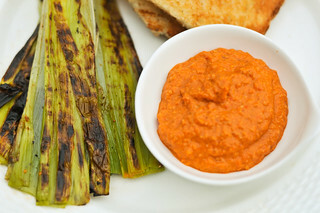 We made these in the oven - don't have a grill. but they were still fantastic. Thanks for sharing your recipe! @NatashaRL Glad you liked them! I make these in the oven often too, turn out just about the same either way you go.